If you guys only knew how often I visit The Home Depot you would seriously laugh out loud. I can recognize every worker at all of the stations, and I can even point customers in the right direction if they need help finding something. My husband knows some of the employees by name! So, yes…we do love The Home Depot and their products. I am not saying that because I have to…I am saying that because I want to. 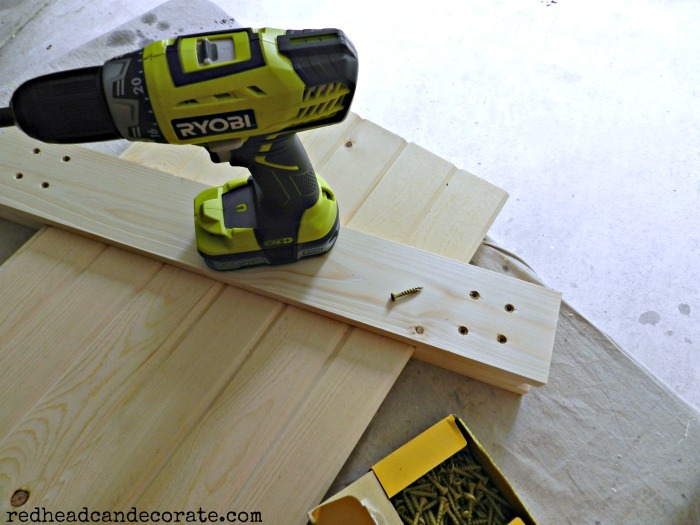 With that being said…I was so excited to be invited back to this years DIH Workshop Virtual Party by my sweet friend and colleague, Maryann from Domestically Speaking. 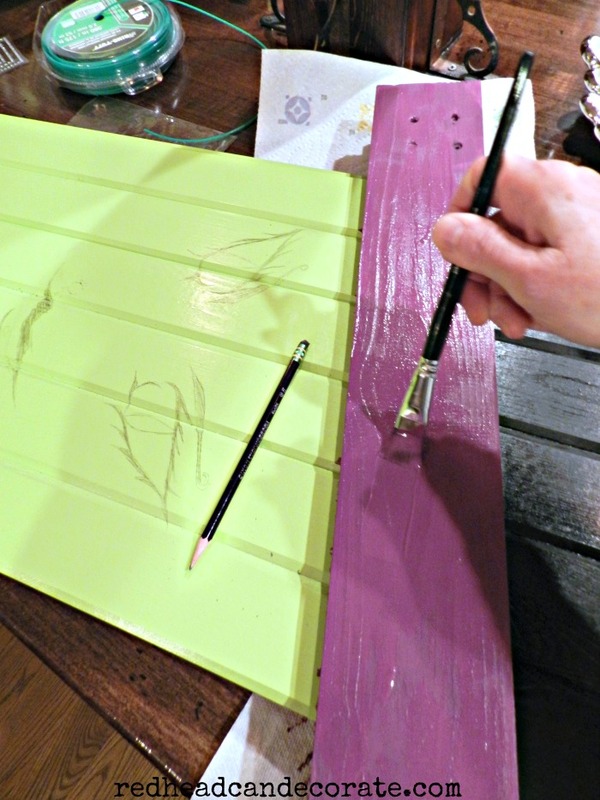 25 DIY bloggers are participating this year and it’s all about building a “Seasonal Character Door Hanger”. 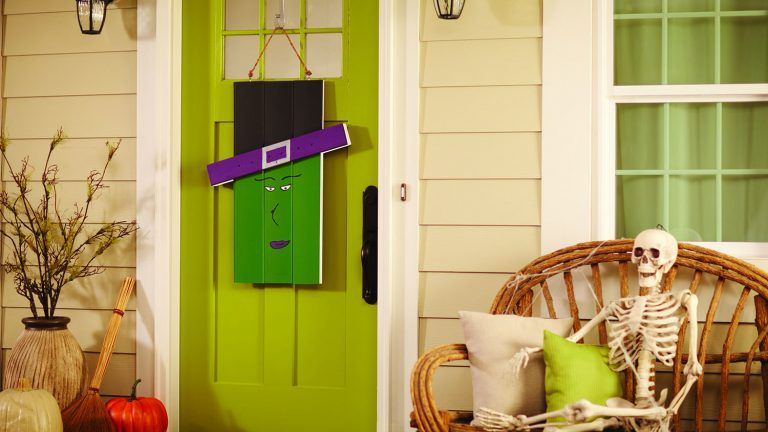 I will not only be showing you how to make a seasonal character door hanger, but I will tell you how to sign up for your local Home Depot DIH Workshop so you can make your very own! 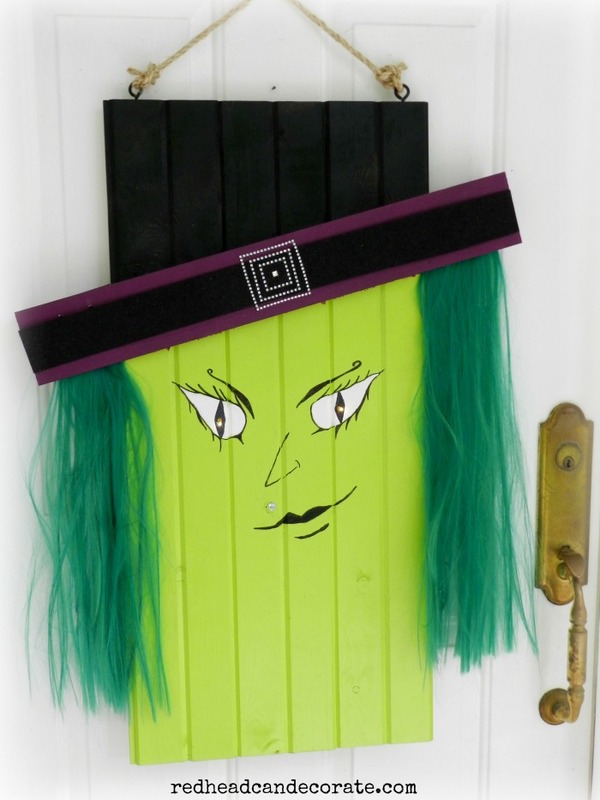 I fell in love with the witch and really needed something cute for our front door that was focused more on Halloween rather than just Fall, so I decided to follow suit and create a witch, too. What do you think of “Door-is”? Isn’t she sassy? She looks a little like she’s smirking at you, don’t you think? 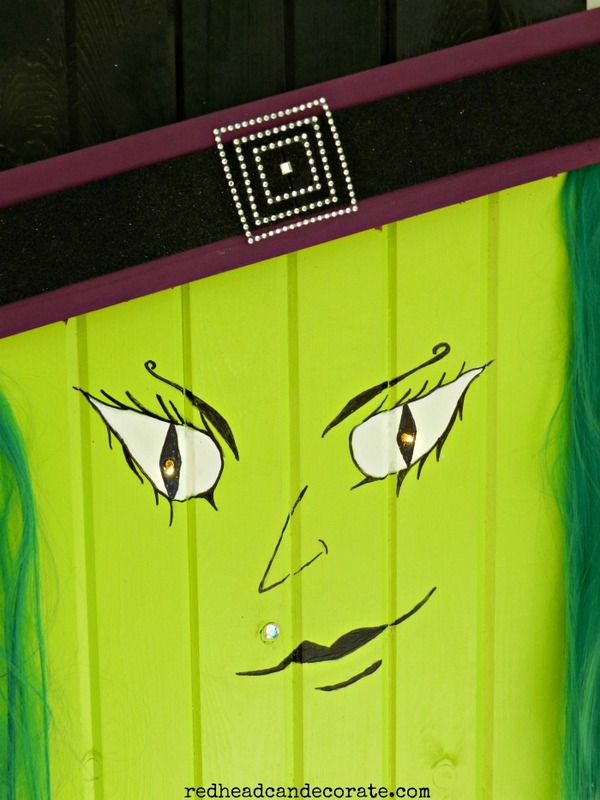 We think “Door-is” is adorable and enjoyed putting our own spin on her. The entire family had a part in creating her and now we will enjoy “Door-is” through the years. 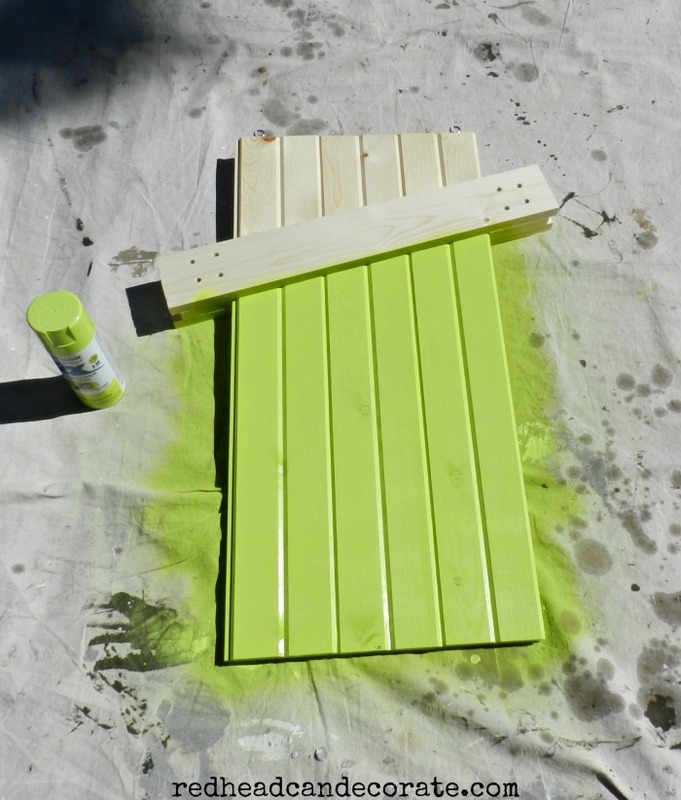 You can register for this DIY workshop at your Local Home Depot right now! -(3) 32″ pieces from the tongue & grove board. Next, glue the tongue & grove boards together to make the base. Then attach the “hat brim” by measuring 8″ down on one side, and 12″ on the other so it’s at an angle like in photo below. 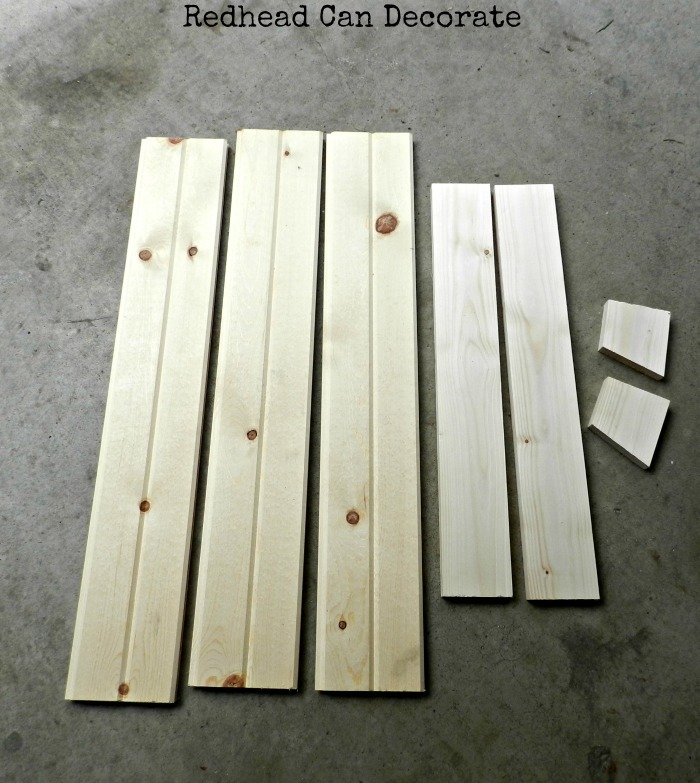 Slide in angle pieces in between 2 larger pieces and secure with screws on both sides. 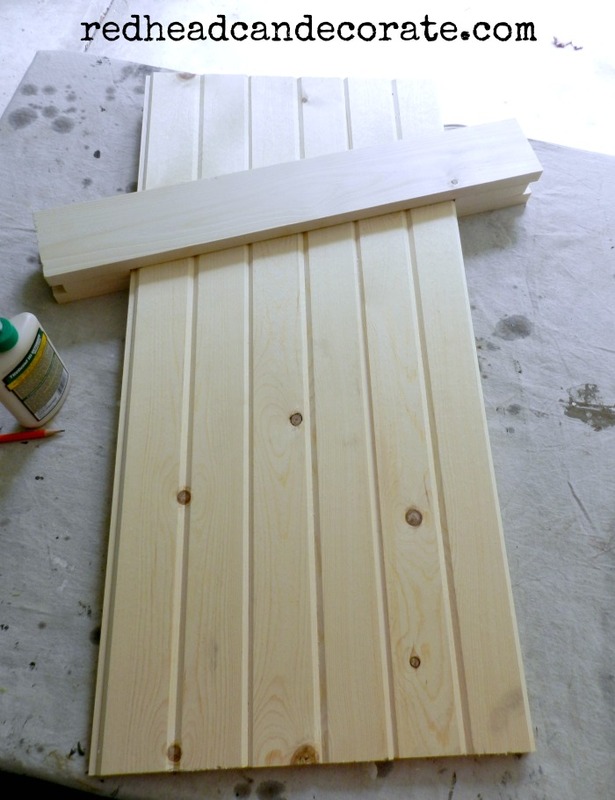 Lastly, add 2 eye screws to the top evenly so it will hang level. Add the rope to hang after you decorate it. Now comes the fun part…decorate it. I painted the face green with spray paint, and the hat with black spray paint. Then, I took it inside and hand painted the brim of the hat with acrylic purple paint. I asked my talented daughter to draw the eyes, and lips with pencil. I managed to draw the nose, but it took me a few hours tries. Then I painted the eyes white with a brush, and once dry outlined them and everything with black permenant marker. We drilled a whole in each eye to stick battery operated fairy lights into it from the back. For the hair, I cut a purple wig from my daughter’s collection and unscrewed the screws just enough to slide the hair in-between the 2 pieces of wood. Then I tightened them up. Lastly, I added a strip of black felt to the purple rim and stuck on some sparkly crystal square shaped stickers for the hat buckle. Oh, and the beauty mark above her lip is a self adhesive crystal. 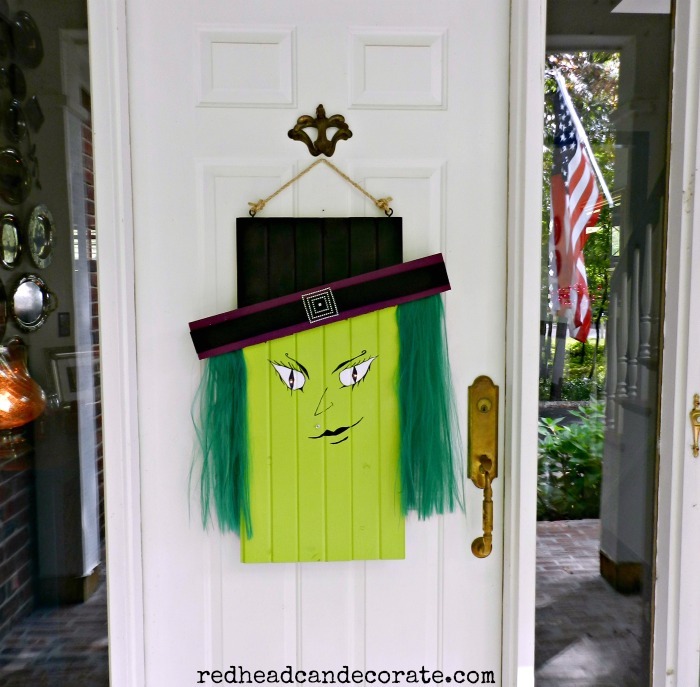 “Witch‘ Seasonal Character Door Hanger” will you make at your local Home Depot? Thank you, Vanessa! Our 16 year old runs a wig company. Thanks, for stopping by, it’s been a fun event! Now that is a witch, so awesome, love her features and lights. Not making her this year but just might for daughter’s house for next year, think they’d like that. Maybe make as sign for yard instead of their door. They live in sub-division in town few miles east of us so have lots of kids going to their door. We don’t get any trick or treaters out here in more rural area, never have in 10 yrs. been out here. Kinda miss seeing the kids all dressed up. Your witch is so cool! I love her bling. Great job, Julie! You can make this a 2 sided seasonal hanger, by painting the back side white with a black hat and make a face for a snowman. Then you can just flip it for the Christmas/ Winter season. I have seen something like this on pinterest. Yes, you can do whatever your heart desires! Love it !!! The hair and the colors are so different. Great job again. My sister, niece, and I are going to the Canton Home Depot tomorrow night to make one!!! Can’t wait. So cute! 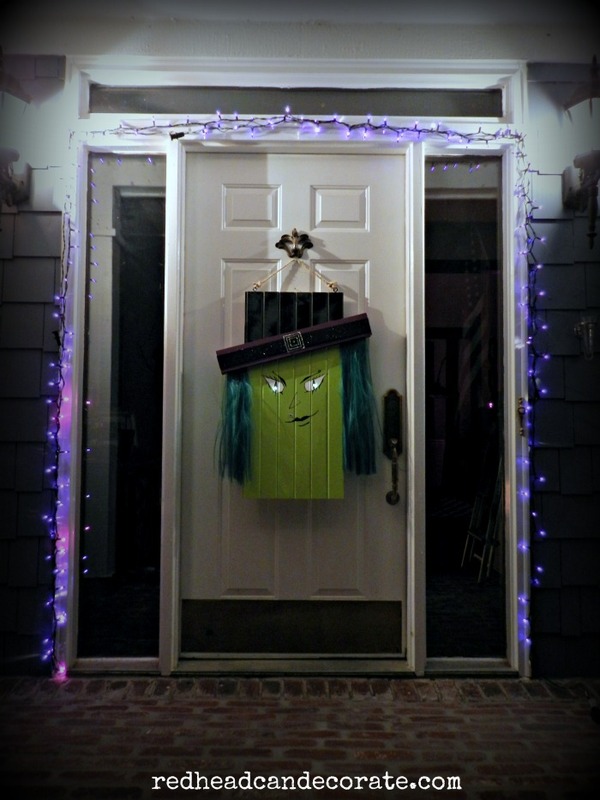 Love this wicked witch – she’s so fun! Very creative. I love, love, love, this project. Very beautiful, would love to have one. Thanks for sharing this beautiful project.